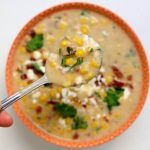 Instant Pot Mexican Street Corn Soup–all the flavors of Mexican street corn in the form of soup! Seriously delicious corn soup that you can eat even in the summer. The other day at a restaurant I had a Mexican street corn salad. The flavors were so great that I knew I needed to make something similar in the Instant Pot. The idea of soup came to my mind and even though it is hot I figured I’d give it a go. The results were a creamy but flavorful soup that all my family gobbled up in our air conditioned home. 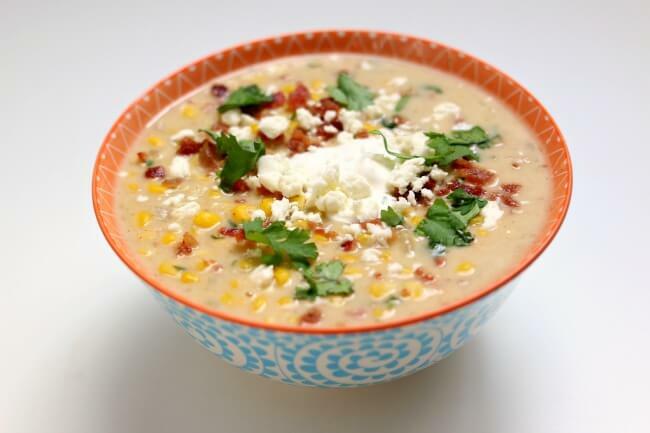 The lime juice plays well off the creaminess and the bacon flavors the whole soup nicely. 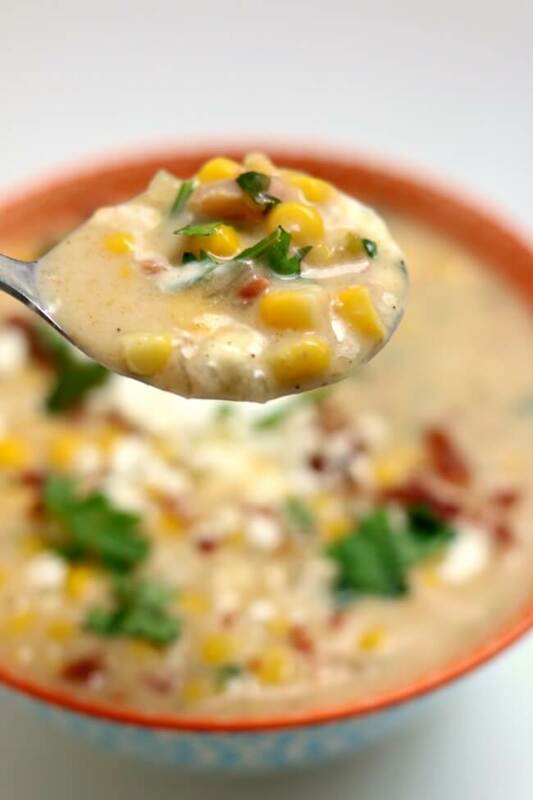 I just used frozen corn to make my soup but if you wanted you could cut off the kernels from fresh corn and add that to the soup…that would be absolutely amazing. To make Instant Pot Mexican Street Corn Soup I used my 6 quart Instant Pot Duo 60 7 in 1*. I love this Instant Pot because it has the yogurt making function which I use almost weekly. It has two pressure settings (high and low), and there are also little slots in the handles so that you can rest the lid there instead of putting it down on your counter-top. 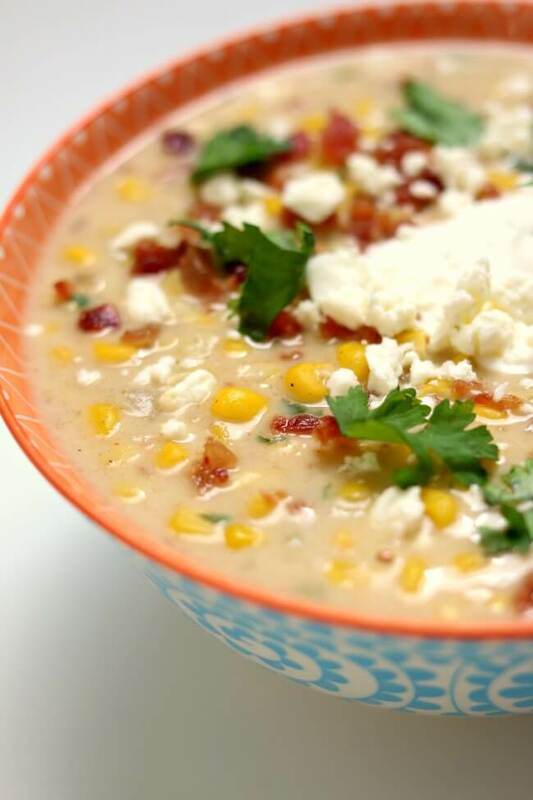 All the flavors of Mexican street corn in the form of soup! Seriously delicious corn soup that you can eat even in the summer. Turn your Instant Pot to the saute function. When the display reads HOT add in the butter. Swirl the pot around and melt the butter. Add in the onion and jalapeno. Sprinkle in the cumin and chili powder. Saute for about 3-4 minutes. Then stir in the garlic and saute for 30 seconds. Deglaze the pot with the chicken broth. Add in the corn, sugar and salt. Cover the pot and secure the lid. Make sure valve is set to sealing. Set the manual/pressure cook button to 5 minutes on high pressure. When the time is up let the pot sit there for at least 10 minutes. Then move the valve to venting and release any remaining pressure. Remove the lid. In a glass measuring cup whisk together the half and half and the cornstarch until the cornstarch is dissolved. Stir the mixture into the Instant Pot. Turn the Instant Pot to saute to heat up the half and half. Stir in the lime juice, cilantro and bacon. Once the soup has thickened turn off the saute function. Ladle the soup into bowls and top each serving with a tablespoon of cotija cheese. 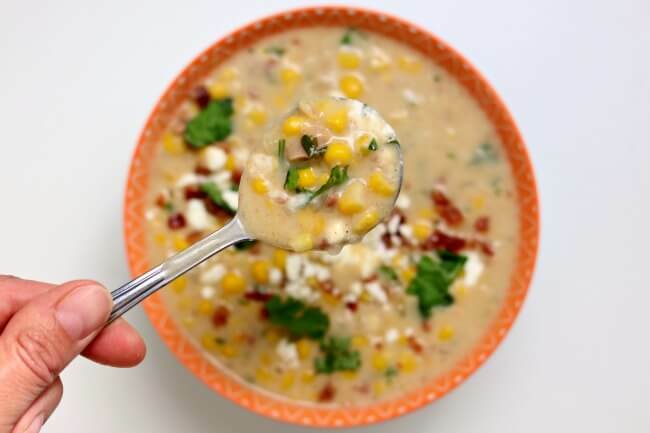 Like this recipe for Instant Pot Mexican Street Corn Soup? Get all my new recipes delivered to your email inbox by signing up below. Fantastic soup! The lime really wakes it up! I added a squeeze more in each bowl after I served it. I like mine a bit spicier so I put some chili flakes at the end also. Thank you so much for this recipe! To make this vegetarian, would I use the same amount of vegetable broth (and of course leave out the bacon) or would it be runny? I never know if subbing something out might effect texture/etc. That’s how I would do it if I were you! Can I substitute 2% milk for the half and half? What do think about adding some protein? Maybe some shredded chicken? Or ground turkey?